Sometimes I think my grandmother should have written a book called “101 things to do with puff pastry.” There are at least 20 recipes in “The Art of Find Baking” alone that use this buttery flaky dough. Also known as the elephant ear or palm tree, the classic French Palmier is more versatile than you may think. Instead of rolling the dough in just plain sugar, cinnamon sugar can be used for extra spice. By folding the dough into the more traditional palmier shape (versus the four-finger), these pastries look similar to a heart and are the perfect accompaniment for that morning cup of coffee on Valentines day. It may be a bit of a stretch but if Parmesan cheese is used instead of sugar (a far less traditional ingredient), these turn into a delicious game day appetizer for the super bowl. Who knew these simple pastries had so many uses? The key to a delicious palmier is to make them yourself and eat them fresh. Those sad boxed palmiers you see at the grocery store do not do them justice. Most of us don’t have time for the lengthy process of making puff pastry so store bought puff pastry may be used. As long as you bake them yourself, these snack-worthy pastries will be much better than the often stale, pre-made ones. Since rolling and folding the dough into the palmiers shape may seem daunting or even confusing, I have included the below illustration from “The Art of Fine Baking.” For those of you who are not familiar with this baking book, it’s full of these charming old fashioned illustrations and this one in particular is actually quite helpful. 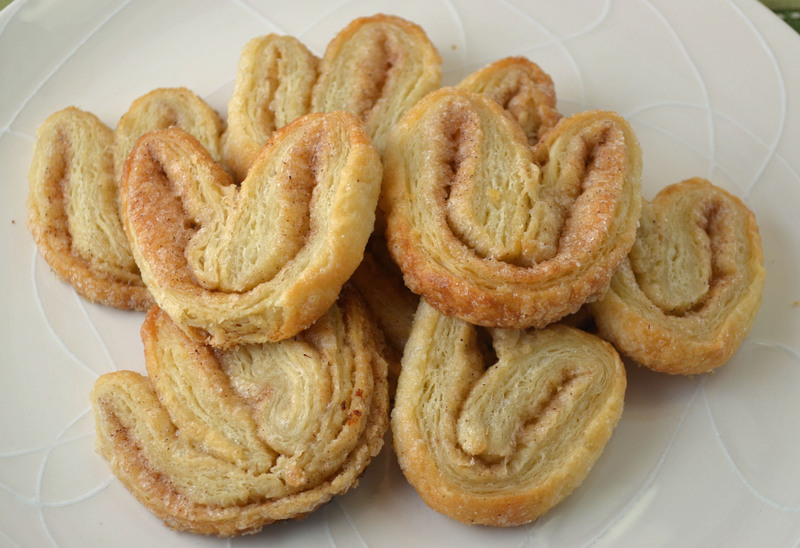 So the next time you have extra puff pastry or are looking for a fun, easy snack – give palmiers a chance. You may be surprised how much you like them. Roll out puff pastry in sugar to make a long strip ten inches wide and 1/8 inch thick (if using cheese instead of sugar, roll out pastry in flour). Sprinkle with sugar (or cheese). Determine the center of the strip. Fold each long side inward into thirds, so that two folded halves meet exactly in the center. Then fold halves together to make a compact 6-layer roll. Coat with additional sugar or cheese. Wrap in wax paper and chill for 1 hour. Preheat oven to 350 degrees. Cut roll into 1/4 inch slices. Place well apart on ungreased baking sheet. Spread the two halves of each slice slightly so they can expand while baking. Bake about 30 minutes, turning slices over once with a spatula after 25 minutes. Bake until golden brown.